L to R: SSU President Cheryl D. Dozier, District 3 Alderman John Hall, Head Coach Cedric Baker, SSU Director of Athletics Sterling Steward, Jr. The Savannah State women’s basketball team was honored today by the Savannah City Council and SSU alumna Mayor Edna Jackson in a ceremony preceding the council’s regular meeting for winning the 2015 Mid-Eastern Athletic Conference (MEAC) Championship Tournament and earning the school’s first NCAA Division I basketball Championship Tournament berth. 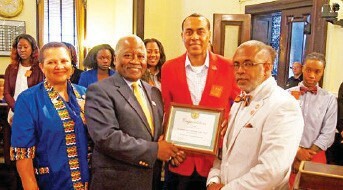 District 3 Alderman John Hall presented Savannah State President Cheryl D. Dozier, Director of Athletics Sterling Steward, Jr. and head coach Cedric Baker with a certificate of recognition for the team’s accomplishments during the 2014-15 campaign. The SSU campus is located in District 3. President Dozier, Mr. Steward and coach Baker spoke to the council in regards to the importance of the team’s historic accomplishments this year, and Mr. Steward presented each council member with a gift bag that included a signed poster from the team. The 2015 Lady Tigers finished the season with the best overall record in Division I history, 21-11, and the school’s first conference title in women’s basketball since the 1975-76 season. SSU had an 11- game winning streak in the 2014-15 season that stretched from February 7, 2015 to March 14, 2015, and a school record 13 MEAC wins. During the regular season, they earned wins over the University of Florida, Troy University and five-time defending MEAC champions Hampton University. The Lady Tigers historic run ended with a 48- 81 loss to South Carolina. The Gamecocks, who spent 12 consecutive weeks as the No.1 team in the country, ended their season in a Final Four game against Notre Dame. Coach Baker was named the 2015 MEAC Coach of the Year. Senior Jasmine Norman was named the 2015 MEAC Championship Tournament’s Most Outstanding Player. For more information on Savannah State women’s basketball visit www.ssuathletics.com.